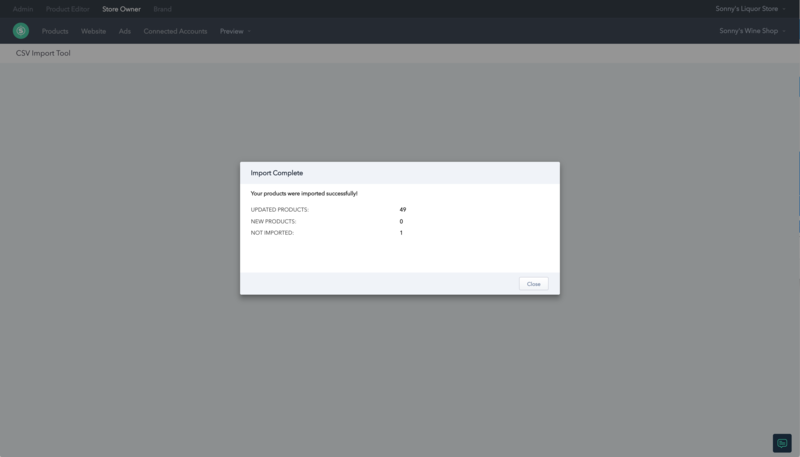 Learn how to upload a CSV of your store's products to begin generating product-specific content for your store in minutes. 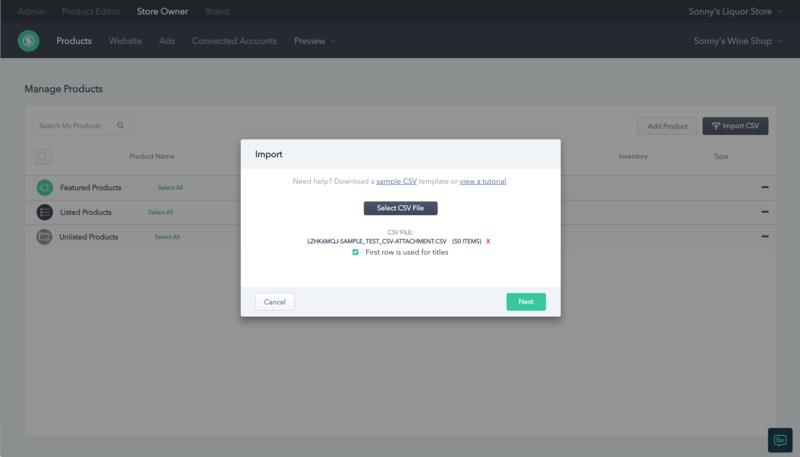 To begin, login to your Sellr Dashboard and navigate to the Products tab. 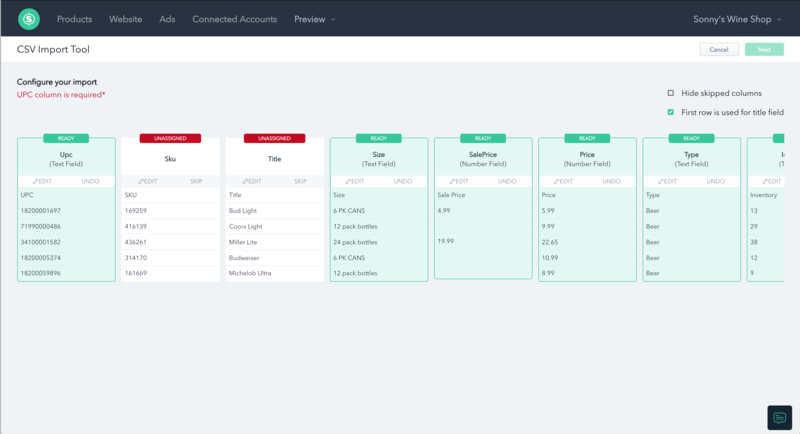 This is where you will be able to view and make changes to your products, including manually adjusting a product's size, price, or sale price. 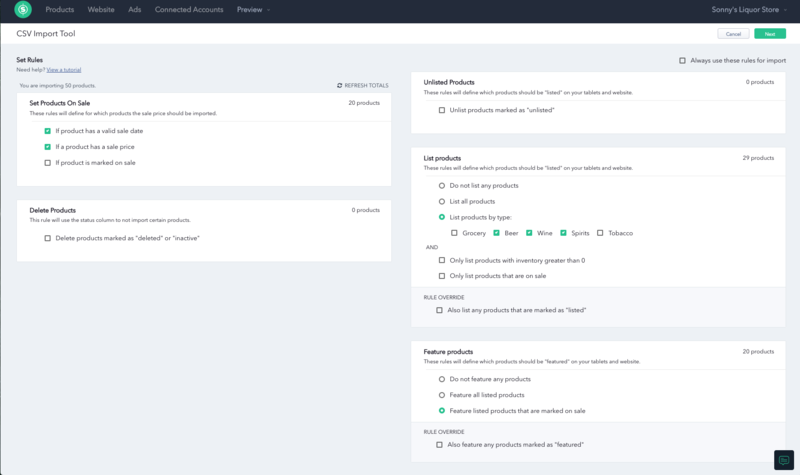 Here you will also be able to feature or list specific products to promote to your customers. More information about featuring and listing products can be found here. 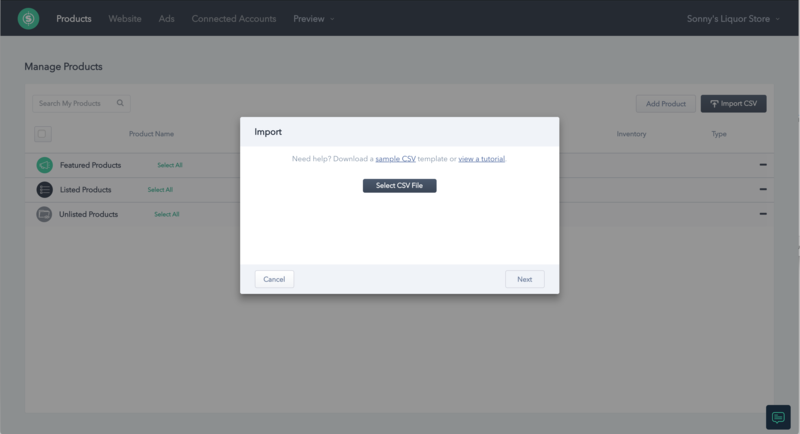 In the top-right corner of your Products page, you will find an "Import CSV" button. Click that to begin the importing process. You will see a pop-up window that shows you the name of your file (see below). Click Next to proceed to the next step. NOTE: The format of your file must have a .csv extension in order to be successfully imported. If you're unsure of how to do this, here's a simple how-to. If you have multiple stores and they share the same products, simply repeat this import process for each store to ensure consistent and accurate data. *Note: Sale start and end dates activate the sale price for the designated period of time. The rules you set will affect the listing status. *Note: Sale start and end dates in the CSV must be uploaded within the same month of the sale to activate the sale price. For example: If the CSV is uploaded in March, the sale price will activate with the designated Sale Start and Sale End as 3/1/18 and 3/15/18. The sale price will not activate for the desinated Sale Start and Sale End if it is outside of March, such as 4/1/18 (Sale Start) and 4/15/18 (Sale End). To edit a column, click on EDIT underneath the Column Name. Select the correct product information from the drop-down menu. Click Save. * Note: A product must have an associated UPC / Sku / Barcode in order to be imported. Any products missing this data will be skipped during the import process. All other products will still be imported. **Note: All columns must be ready in order to go to the next step. You may skip a column to move forward. This page allows to set rules on how you would like to list your products on your website and tablets. product has a valid sale date - this uses the "Sale Start" and "Sale End" dates to determine if its a valid date. 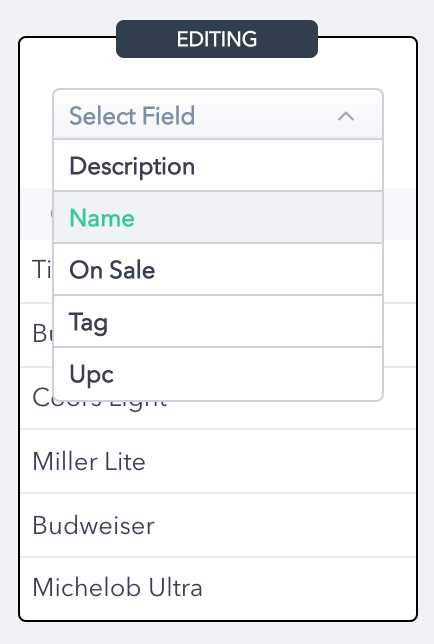 product is marked on sale - this will use the status column and count any product that has the status of "sale" or "onsale". Then, if you would like to delete products that have the status of "deleted" check the corresponding box. Select which products you would like to have featured, listed, and unlisted on your website and tablets. You can always click Refresh Totals to see how many products change status based on your rules. 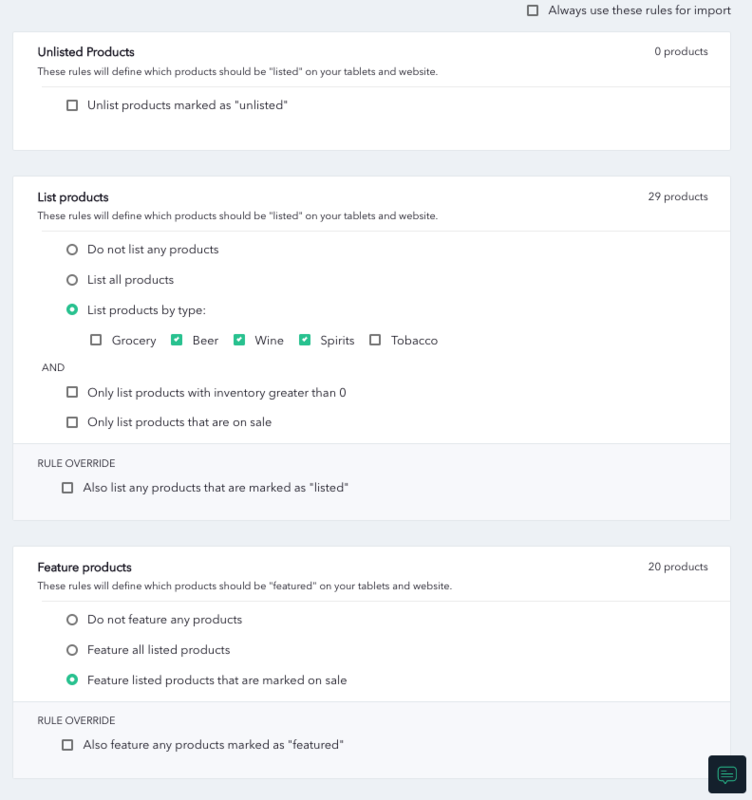 Unlisted - Products be hidden from your website and tablet, and you can list them anytime! These products can be scannable on your tablet. 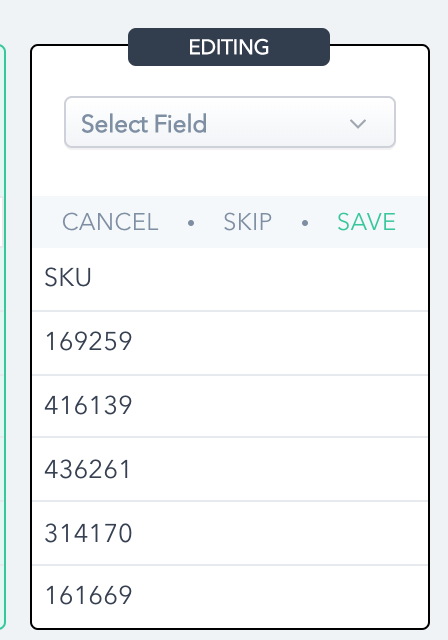 List all products on your CSV. 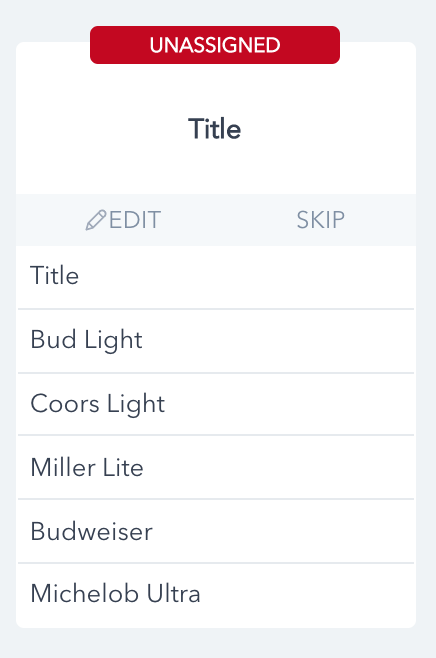 List products by type. Check each box for the type you would like listed. 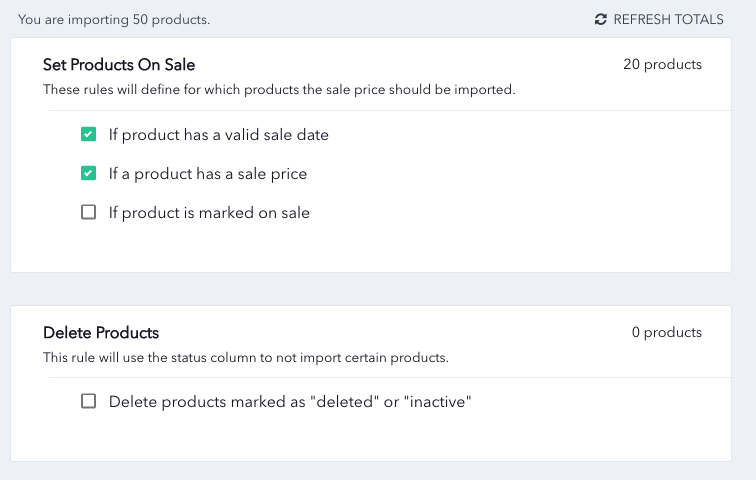 Also you can add the rules of only listing products with inventory greater than 0 and products that are set on sale. 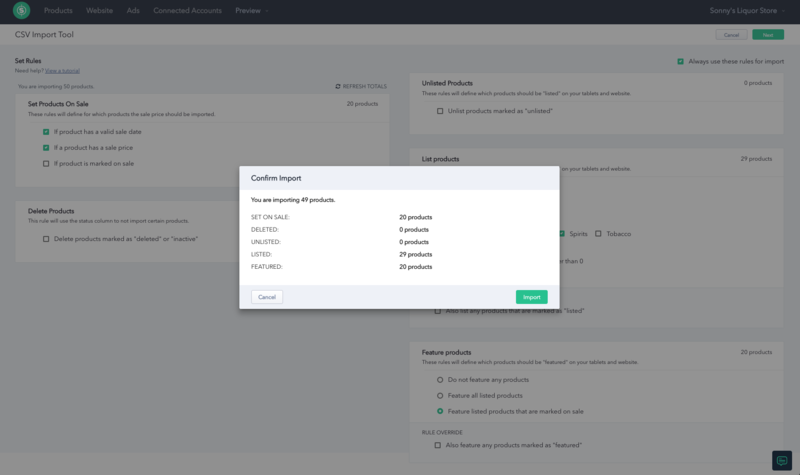 Rule Override allows you to list your products with the status of "list" or "listed" and overrides the rules you have set. Featured - Products that you want distinguished. If you have a tablet, they’ll show up in the first pane. If you have marketing services, we’ll promote them for you on social media and in your newsletter! They will also be featured as the top products on your website. Do not feature any products. This means all of your products will either be listed or unlisted. Feature all listed products. This will feature all the products that met the rules to be "listed" from the above box. We recommend that you only select a few products in order to distinguish them from your inventory. Feature listed products that are marked on sale. This is a great and easy way to always have the most-up-to-date information on your products showing up first on your website product list and tablets! Rule Override allows products that have the status of "featured" to be featured and overrides any rules that negates that product to be featured. Tip: Check the box for Always use these rules for import for your next CSV upload. You will see a pop-up to review the import. Confirm the import is set to your desired rules. Cancel to go back and change any settings. Import if it is ready to import. Note: Products may not import because the UPC is a duplicate of a UPC that already exists in your store. If you don't see the Success screen (above), please don't hesitate to reach out to our support team by clicking the green chat icon on this page. We'll treat you like the VIP that you are.